Quantitative risk assessments (QRAs) for landslide hazards are increasingly being executed to determine an unmitigated level of risk and compare it with risk tolerance criteria set by the local or federal jurisdiction. This approach allows urban planning with a scientific underpinning and provides the tools for emergency preparedness. 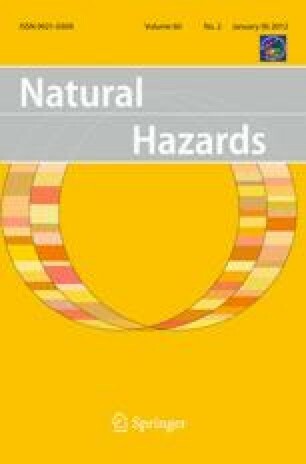 Debris-flow QRAs require estimates of the hazard probability, spatial and temporal probability of impact (hazard assessment) and vulnerability of the elements at risk. The vulnerability term is perhaps the most difficult to estimate confidently because (a) human death in debris flows is most commonly associated with building damage or collapse and is thus an indirect consequence and (b) the type and scale of building damage is very difficult to predict. To determine building damage, an intensity index (I DF) was created as the product of maximum expected flow depth d and the square of the maximum flow velocity v (I DF = dv 2). The I DF surrogates impact force and thus correlates with building damage. Four classes of building damage were considered ranging from nuisance flood/sedimentation damage to complete destruction. Sixty-six well-documented case studies in which damage, flow depth and flow velocity were recorded or could be estimated were selected through a search of the global literature, and I DF was plotted on a log scale against the associated damage. As expected, the individual damage classes overlap but are distinctly different in their respective distributions and group centroids. To apply this vulnerability model, flow velocity and flow depth need to be estimated for a given building location and I DF calculated. Using the existing database, a damage probability (P DF) can then be computed. P DF can be applied directly to estimate the likely insurance loss or associated loss of life. The model presented here should be updated with more case studies and is therefore made openly available to international researchers who can access it at http://chis.nrcan.gc.ca/QRA-EQR/index-eng.php. This work was made possible and supported by the Chemical, Biological, Radiological/Nuclear, and Explosives Research and Technology Initiative (CRTI) and the Public Security Technical Program (PSTP)—(Quantitative Risk Assessment Project 09/10-0001SCP), which is managed by the Defence Research and Development Canada—Centre for Security Science and Natural Resources Canada. Comments by Murray Journeay, Nicky Hastings, Rejean Couture, Scott McDougall and two anonymous reviewers are acknowledged.